Kindling: What's Your Creative Process? 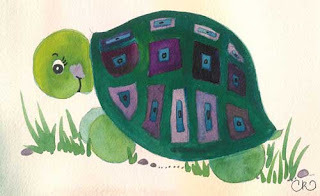 My creative process resembles the turtle. I'm tough. I can't be easily crushed because of my hard shell. I'm grounded yet flexible, surviving on land or in water. But I move oh-so-slowly. This was a huge frustration for me for many years. Until I realized: My creative process isn't about just one turtle. 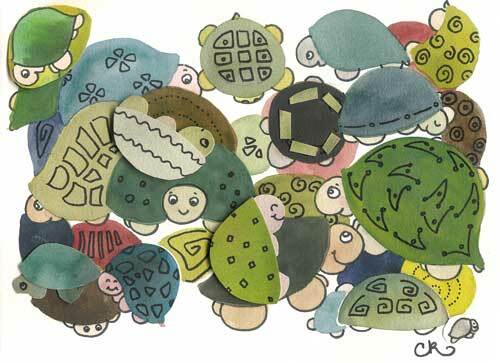 It's about multiple turtles. Here is an image of My Brain On Ideas. I have several different creative projects happening all at once. I may be working on short and long forms of fiction and nonfiction while also putting together poems and dreaming up ideas for workshops and classes; all the while I'm parenting, painting, doodling, coaching, and learning. What is Most Excellent is this. Several of my turtles are reaching the finish line at just about the same time. So, although they're slow: they're cute, they're tough, and eventually--eventually! They do get where they need to go. How about you? What is your pace and style of working? Are you learning to honor it, or does it frustrate you?